On other Bible translations, the word “pray” was “ask” and “beseech”. Beseech has a stronger meaning: begging, imploring fervently and with urgency. Even though some of us are not able to go to these 10/40 Window areas, Luke 10:2 encourages us to pray, to beseech that the Lord will send out laborers to these hard-reached areas to spread the Good News. Steering our focus back to domestic soil, how many people do you know that have not received Jesus as their Lord and Savior? How many people in your vicinity have never heard of the Gospel before? Many think that because people live in countries that are predominantly believing in the Christian faith, that all these people know about Jesus. But that is far from the truth. Even in the US, there are people who have never heard of Jesus. I have a story that Megan (not her real name) approached someone who came from Vietnam and asked if he would like to know Jesus. The response was, “Who is Jesus?” Megan was a bit surprised and queried, “You don’t know Jesus?” “No,” said the Vietnamese man. Megan learned quickly that not everyone in the US knows who Jesus is. Megan proceeded to tell the man about Jesus. The lesson here is that one should not assume everyone in the US knows about Jesus or who Jesus is. 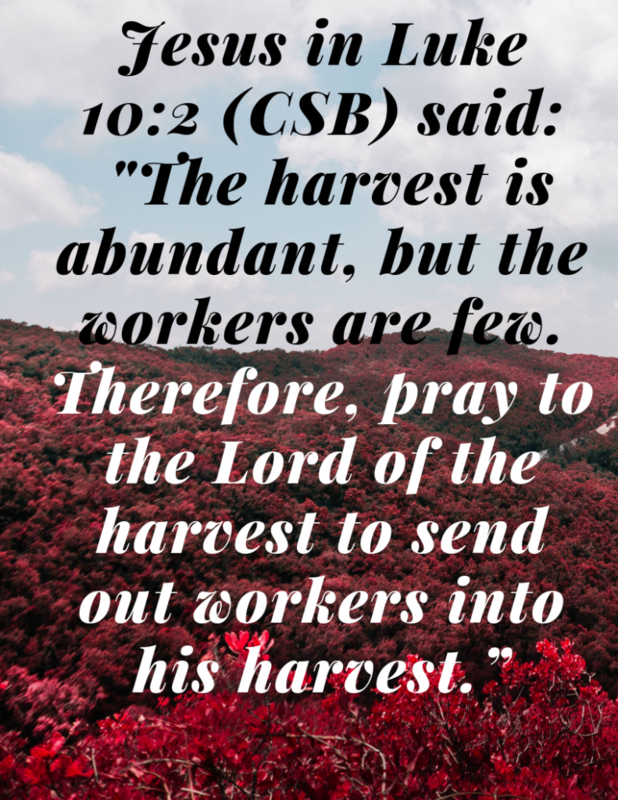 The harvest is plentiful, but the laborers are few. What should we do about it? Pray, pray, pray. Pray that people you know, loved ones, friends, acquaintances, relatives, neighbors, co-workers, etc. who have not received Jesus as their Lord and Savior will receive Jesus into their lives. The key is to pray, to beseech for the harvest to be sown so that there will be a reaping of souls into the Kingdom of God.